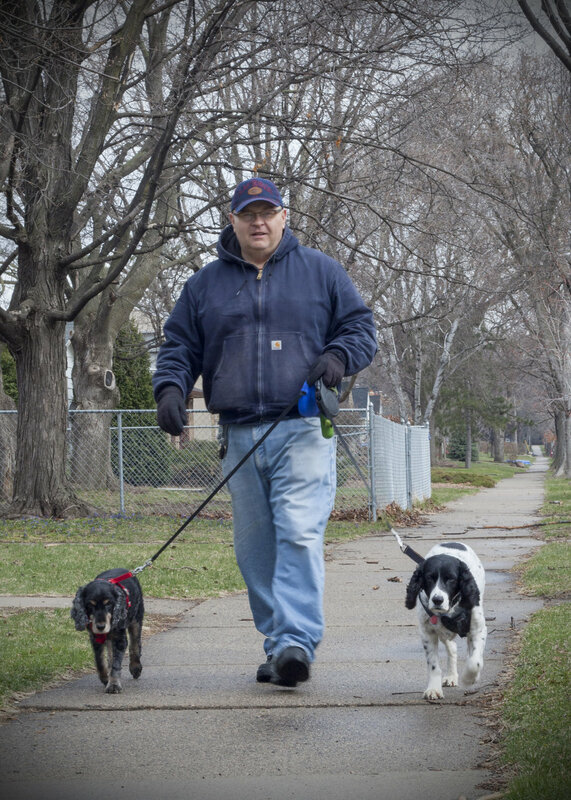 Ed has been dog-walking and providing pet-care with Come, Sit, Stay since 2012 and is a certified pet care provider/sitter through the National Association of Professional Pet sitters (NAPPS). He is also certified in first aid for cats and dogs and is certified in the care of reptiles, birds, fish and smaller mammals such as gerbils, rats and ferrets. Ed has also done volunteer dog walking for people at a local senior care center. His first pet was a cocker spaniel named Fala and one of his favorite memories of Fala is the time he chased a wandering moose out of the front yard. Ed also grew up with many other pets such as birds, fish, gerbils, and cats. One of Ed’s favorite fictional animal characters is Brian, the family dog in the TV show Family Guy. Ed loves that as a dog-walker and pet-care provider he can enhance animals’ lives, bring joy and nurturing to them, and that they in turn enhance his life, too, simply by being present in it. He considers it a remarkable give and take and he always tries to tune in to what they may be feeling and what their needs may be at each moment.